Top of the charts in the UK, but the BBC won’t play it due to its policy of pre-election balance. Oh, and it’s a catchy tune too. This British police intimidation of a blogger is much less heavy-handed than the hammer the Mayor of Peoria brought down on a parody Twitter account. The Cambridge, UK story is, however, creepy insofar as it could be read to suggest that the police support the far-right UKIP party. Then again, the UKIP complainant was a local councillor, so maybe it really is the somewhat-less-unkind UK version of the Peoria story. After all, in Cambridge, no property was damaged or seized or destroyed. And no judges signed off on spurious warrants either. Every Country England Has Ever Invaded (all but 22 countries in the world). Reading about Sen. Cruz calling other Republicans ‘squishes’ because they were not, at least in his telling, as hard-line as he is, reminded me of when I lived in the UK and the late Margret Thatcher and her supporters derided their less-immoderate fellow Tories as the “wets”. It also made me wonder about the national differences the two terms imply. Am I alone in thinking that there’s some suggestion of unmanliness about ‘squishes’? And if so, is that in fact tied to a national difference, or just to the gender and general sexism of the particular speaker? Historically, the term “wet” was English public school slang for someone judged to be weak, feeble or “soppy”. Within the political context it was used both as a noun and an adjective to describe people or policies which Thatcher would have considered to be weak or “wet”. So maybe it isn’t all that different after all? … principled people have quit over the LibDems’ support of the “justice and security bill,” which establishes a system of secret courts in Britain in which people who sue the government over torture and kidnapping will not be able to see the government evidence offered against them. The LibDem leadership supported this law, whipped their MPs to vote for it, and all but seven of the sitting LibDem MPs did, despite the enormous public outcry against it, including a condemnation from Lord Neuberger, the country’s most senior judge. The Lords — a chamber full of senior lawyers and judges — has rejected this legislation and sent it back, calling for a system of safeguards to be put in place before upsetting the principle of open justice going back to the Magna Carta. Parliament has ripped up the Lords’ amendments, refusing even the most basic of safeguards in this legislation. We voted for the LibDems to be the “party of liberty,” but they’ve been anything but. With this latest betrayal of party principles, the leadership has scuttled any credibility it had left. There is simply no case for this measure. The proponents of the law act as though there is a flood of baseless claims of torture and kidnapping that the government has had to settle in order to avoid revealing the secrets of Britain’s spies. The truth is that the government has had to apologise for lying about its role in illegal torture and kidnapping, and that most of its victims are unable to get justice even today. Indeed, we don’t know for sure that the practice has stopped, and we can’t, because we’ve had more than a decade of “war on terror” nonsense that says that the public must be spied upon at all times, but that politicians and police must be able to operate in unaccountable secrecy. Cory also points to Philippe Sands’s letter of resignation in today’s Guardian. It is said that when Kwame Nkrumah made Ghana officially into a one-party state in 1964, a reporter from the Associated Press asked Nkrumah how he, supposedly a proponent of democracy, could do such a thing, giving voters only one party to choose among. 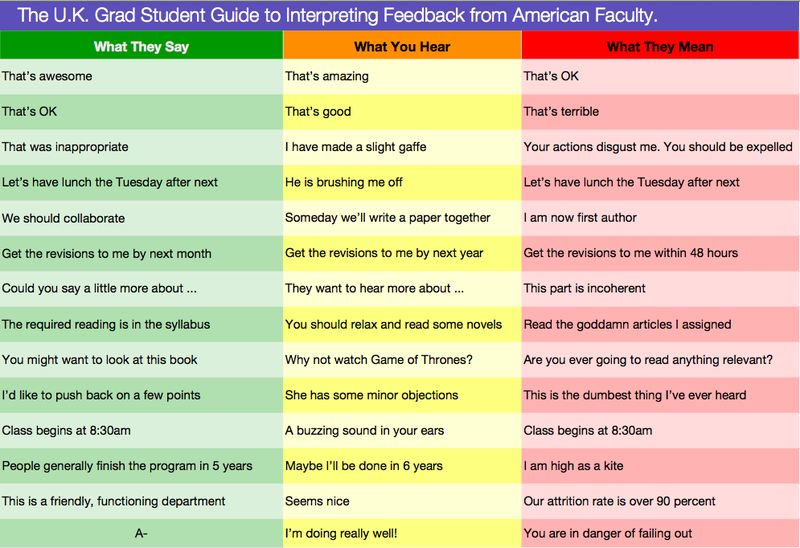 The U.K. Graduate Student’s Guide to Interpreting Feedback from American Faculty — Kieran Healy (Duke), via Leiter.